(NaturalNews) Ferocious vaccine manufacturers are constantly on the move, looking for new "demographics" to shoot with vaccines. If they could stick a needle into a rock and get paid for it, they would find a reason to do it. But in this case, we're talking about pregnant women. Protection, protection, protection—that's the cover the government keeps pushing. Meanwhile, the vaccines they're foisting on pregnant women have a track record of damage. "In 2006, CDC officials directed doctors to give all pregnant women a flu shot and, in 2011, a Tdap shot during every pregnancy, no matter how little time has elapsed between pregnancies. Prior to FDA licensure, influenza, diphtheria, tetanus and pertussis vaccines [Tdap and flu shots] were not tested in or proven safe and effective for pregnant women in large clinical trials when given during every pregnancy either singly or simultaneously." 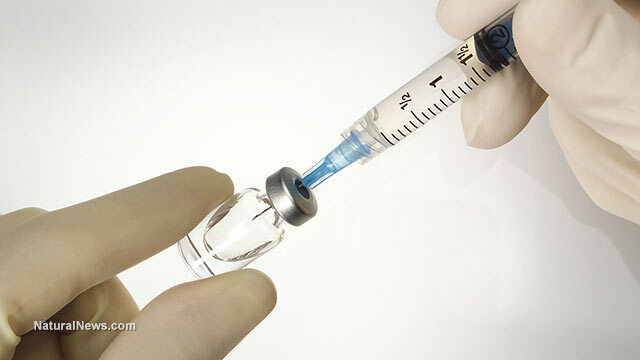 "Categorized by FDA as Pregnancy Category B and C biologicals because it is not known whether the vaccines are genotoxic and can cause fetal harm or can affect maternal fertility and reproduction, administering influenza and Tdap vaccines to pregnant women is an off-label use of these vaccines. It is a policy that assumes maternal vaccination is necessary, safe and effective without proving it." "...pertussis containing vaccine [Tdap] injuries and deaths are the most compensated claim in the federal vaccine injury compensation program (VICP) for infants and children, while influenza vaccine-related injuries and deaths are the most compensated claim for adults. And yet, in the absence of credible biological mechanism and epidemiologic evidence pre-licensure proving these vaccines are safe for all pregnant women, their fetuses and newborns, female health care workers are being fired for refusing to be injected with them while they are pregnant." "The National Vaccine Information Center is opposed to FDA retroactively licensing influenza and Tdap vaccines for use in pregnant women and fast tracking RSV [respiratory syncytial virus] and group strep B vaccines to licensure..."
No evidence of safety, but so what? Reports of injuries and deaths, but so what? Pregnant women are a "lucrative market," and that's all that counts. Need a terrific target for further disabling the population? Pregnant women are ideal. The FDA and its army of allies will assure you that these untested and off-label uses for vaccines are perfectly safe, because all vaccines are safe. The FDA speaks for the pharmaceutical industry. Yesterday, today, and tomorrow. It might be tempting to say the FDA is careless, is overlooking important factors—but it's much, much worse than that. —In a stunning interview with Truthout's Martha Rosenberg, former FDA drug reviewer, Ronald Kavanagh, exposes the FDA as a relentless criminal mafia protecting its client, Big Pharma, with a host of mob strategies ("Former FDA Reviewer Speaks Out About Intimidation, Retaliation and Marginalizing of Safety," 7/29/2012). Kavanagh: "...widespread [FDA] racketeering, including witness tampering and witness retaliation." "I was threatened with prison." "One [FDA] manager threatened my children...I was afraid that I could be killed for talking to Congress and criminal investigators." But honest appraisal wasn't part of the FDA culture, and Kavanagh swam against the tide, until he realized his life and the lives of his children were on the line. What was his secret task at the FDA? "Drug reviewers were clearly told not to question drug companies and that our job was to approve drugs." In other words, rubber stamp them. Say the drugs were safe and effective when they were not. Kavanagh's revelations are stunning. He recalls a meeting where a drug-company representative flat-out stated that his company had paid the FDA for a new-drug approval. Paid for it. As in bribe. ***Kavanagh remarks that the drug pyridostigmine, given to US troops to prevent the later effects of nerve gas, "actually increased the lethality" of certain nerve agents. Women have to know what is waiting for them, in vials of vaccines, when they become pregnant. Waiting for them and their unborn children. Huxley's Brave New World portrayed a nation of docile citizens. But there, at least, the drug of choice was Soma, a compound that stimulated pleasure centers. Here, we're talking about docility and obedience in the face of suffering, pain, neurological damage, and death. Doctors don't want to know about this. They don't want to know the true story about vaccines. If they did, they'd suddenly remember the body count they've been responsible for. So instead, they polish their act, designed to invoke credibility and, above all, authority. Invent a mountaintop, stand on it, and sell, sell, sell.